Teddy Thomas, the man with the orange boots, is certainly not hard to spot, but stopping him is another matter entirely. Munster learned that the hard way in their Champions Cup semi-final defeat to Racing 92, while Ireland also very nearly paid a heavy price for allowing the elusive French winger to weave his magic late on in Paris back in February. This evening in Bilbao, Thomas is likely to be targeted defensively by Leinster, particularly aerially, yet going the other way, he will back himself in a one-on-one situation against anyone, let alone a 35-year-old in Isa Nacewa. Racing possess an ability to lull teams into a false sense of security by leading them to believe that they are happy to just keep the ball tight and punch holes through the middle via the likes of Camille Chat, Leone Nakarawa and Yannick Nyanga. Their game-plan, however, is based around so much more than that simplified notion. What Racing do exceptionally well, is perfectly time when to move the ball wide to Thomas and co.
With that in mind, the breakdown battle will be key and Dan Leavy in particular has a huge role to play in slowing down Racing ball, which is something that Munster were unable to do. Leinster have defended resolutely throughout their unbeaten run to the final, but even still, they will be fully aware, that if they get caught narrow against Racing, the electric Thomas will be waiting to strike on the edges. "You've got to get defensive width, first and foremost," Stuart Lancaster warned earlier this week. "And you've got to make sure that you've got more than enough to deal with his (Thomas') right footstep and then his offload. "Wayne Barnes will be refereeing. He is an accurate referee. If we respect the breakdown and pick our battles there and we get the right defensive width, we can make sure he doesn't get the space he needs. That was the key to the Munster tries. He got the space that he needed to break the line." Ronan O'Gara did a fine job as skills coach in his time with Racing, and since he left for the Crusaders, another former Munster player, Casey Laulala, has picked up where the legendary Irish out-half left off. The evidence of the pair's work is clear to see in how comfortable the Racing players are on the ball and also how quickly they can transition from defence into attack. In many ways, it is exactly how French supporters want their national team to play. Leinster will know what to expect from Racing, especially in the early stages. Just like Thomas' boots, however, recognising the threat is one thing, but they must nullify it. Munster winger Alex Wootton had a tough time in attempting to keep the 24-year-old quiet in Bordeaux last month. Thomas ran riot in a rampant 17-minute spell that would have seen him score a blistering hat-trick but for his outrageous pass to Maxime Machenaud when he was already over the whitewash. 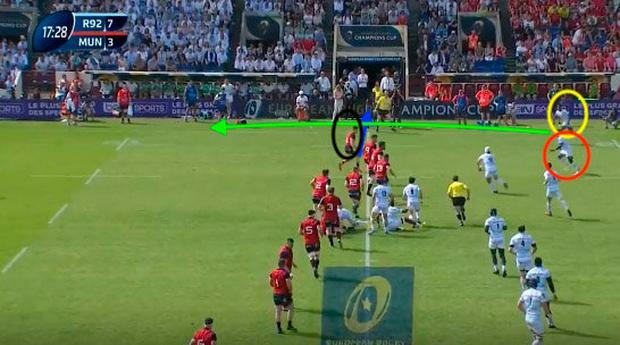 In image 1, we can see that Munster don't have the defensive width that Lancaster referred to. After pounding away at the red wall for multiple phases, Machenaud chooses his moment when to go wide. The scrum-half is a massive loss for his side today, as he is the one who calls the shots. Sam Arnold and Rory Scannell both get drawn to Virimi Vakatawa, who plays a beautiful pass off his left to Thomas (yellow circle). It is interesting to note that Vakatawa mostly plays on the wing for France. We don't often see his distribution qualities when out wide, but that wasn't the case against Munster as he caused havoc in his midfield role - Leinster beware. As a centre pairing, Robbie Henshaw and Garry Ringrose are very experienced, and given that both are outstanding defenders as well as readers of the game, their communication to each other and those around them, will be key to stopping Vakatawa linking up with Thomas. After Vakatawa's pass, Wootton (black circle) is caught in no man's land and even if Thomas doesn't breeze past him, he has Louis Dupichot on his outside, who would have had the easiest of tasks to score in the corner. This was a major warning sign for Munster after five minutes, but they didn't learn their lesson and were unable to prevent Thomas dotting down again 13 minutes later. Image 2 again highlights Munster's narrowness and the space (blue arrow) that is left on the wing. 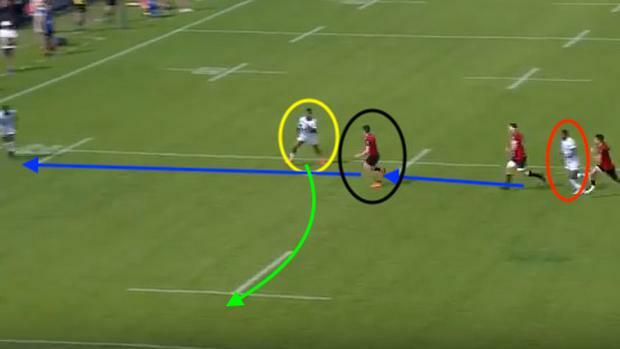 Wootton (black) is sucked in-field and Vakatawa (red) recognises as much. Racing have worked their way through the phases with the powerful Chat and Nakarawa typically in the thick of it. Vakatawa breaks the gain line after Conor Murray misses the tackle. Thomas hugs the right touchline and fractionally checks his run before waiting for his team-mate to put him away. At this stage, Munster are all over the place. They look like they have lost trust in their usually reliable defensive system and, four minutes later, Racing put the result beyond doubt with a third scintillating try. 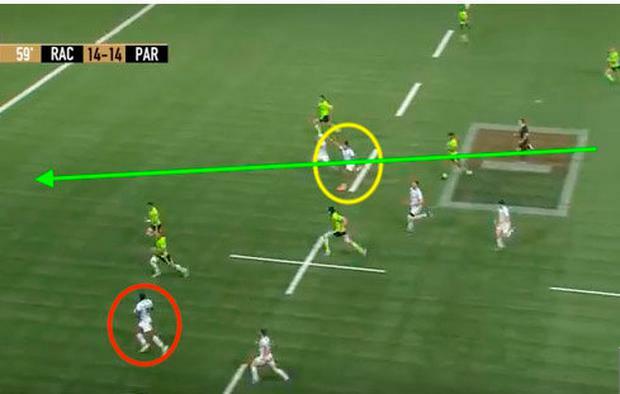 Similar to images 1 and 2, 3 illustrates how Vakatawa (red) has again exploited Wootton (black) on the back of Munster's spacing issues and Thomas (yellow) easily sprints clear before setting up Machenaud to score. 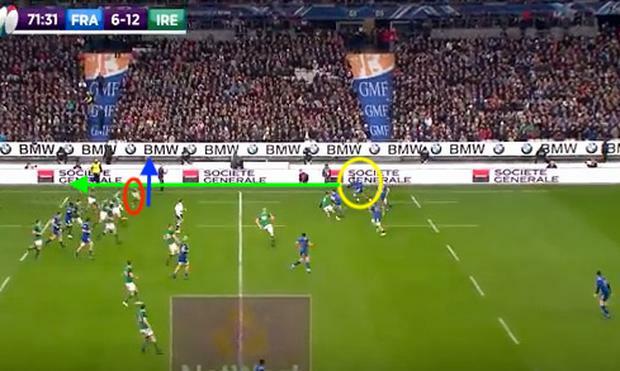 Munster would have seen what Thomas did to Ireland during the Six Nations (image 4), and you can be sure that Rob Kearney (red) will look to find the stand with clearance kicks this time rather than leaving Racing with option of taking a quick lineout for Thomas (yellow) to score. "He is world class, a game-breaker," Nacewa, the man tasked with keeping Thomas quiet, said after yesterday's captain's run. "We saw that during the Six Nations, we saw it against Munster. He's had an outstanding 12 months, I've a lot of respect for how he plays the game. "He likes to get involved too, with a high work rate. As a team we have to be on our toes to watch him. He can make anything from nothing as we've seen in the last 12 months." What we saw against Munster has been a common theme throughout Racing's Top 14 campaign. Image 5 looks familiar, only this time it is Nakarawa that we have circled in red. Thomas (yellow) will arch around the Fijian and use his pace to score. Leinster must be aware of Thomas' smart support lines too. 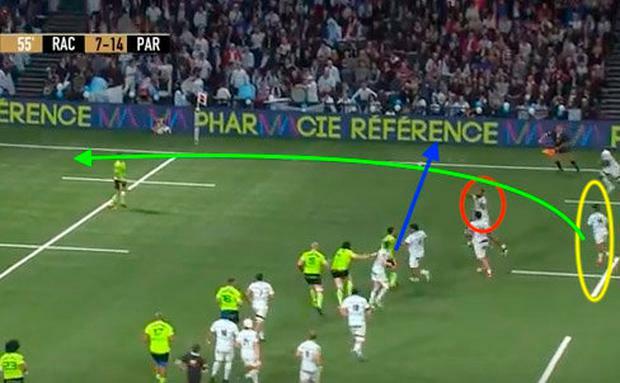 Later in that same game against Stade Francais (image 6), it's that same combination again as Vakatawa (red) hears the call from Thomas (yellow), who has his arm outstretched. The winger will gather the ball after the clever kick through and score. 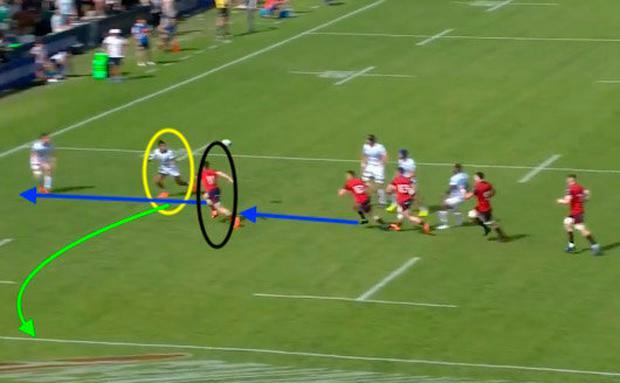 In the thumping home win over Clermont (image 7), Racing again exploit the spacing issues (blue arrows). Dupichot (red) turns provider for Thomas (yellow), who must have white paint on those boots as he dances along the touchline to score. 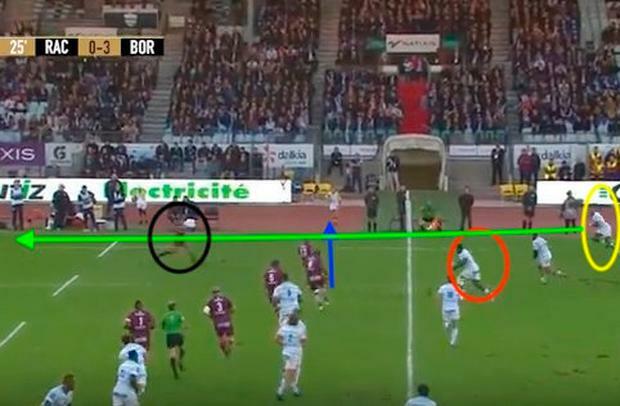 Finally in image 8, Bordeaux fall victim to the same narrowness (blue arrow) as Vakatawa (red) draws the defenders in, before releasing the speedster (yellow). Leinster will have done their homework on Thomas, who has scored 14 tries this season. If they avoid that costly narrow defence and dominate the breakdown, it will go some way to stopping Racing's danger man taking his tally to 15, while at the same time, it would see Leinster take a big step towards being crowned European champions.